Rutgers New Brunswick has the largest university housing and transit systems and at 2,700 acres, one of the largest college campuses in the United States. In its 2030 Master Plan, Rutgers proposes improvements to transportation, housing, open space and facilities that will promote a greater level of cohesion between campuses and a stronger relationship between Rutgers and the Raritan River. The plan includes environmental stewardship efforts and efficient land use strategies to reduce the ecological impact of the campus in addition to proposed boundaries limiting future growth and encouraging greater centralization on each campus. Changes to the Rutgers transportation system includes a focus on the bus system, and pedestrian and bicycle access to the Raritan River and open space. The bus system plan proposes the creation of new bus lanes dedicated to rapid bus transit for transportation between campuses, the construction of a transit hub in a central location on each campus, and the development of a more local bus system. Bicycle and pedestrian walkways will be improved and expanded to promote greater access to the River and to proposed landscape design projects at Woodlawn and the Passion Puddle on Cook/Douglass and Busch central mall. 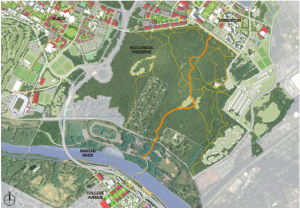 Improved access to the Rutgers Ecological Preserve will be through the construction of new walkways on Livingston Campus and a proposed pedestrian and bicycle bridge across the Raritan River in order to connect Johnson Park and the Ecological Preserve with College Avenue campus. Students will have greater access to the Raritan River through a proposed boardwalk running from College Avenue to Boyd Park. Frank Wong, Executive Director of Rutgers University Planning and Development, presented an overview of the Rutgers 2030 Master Plan at the 2016 Sustainable Raritan River Conference. A copy of his presentation can be found on the conference webpage. The 2030 Master Plan is available at: http://masterplan.rutgers.edu/reports/rutgers-2030-volume-1-new-brunswick. For further information contact Frank Wong at fwong@facilities.rutgers.edu.